The shock absorber is provided provide the damping of the spring to prevent excessive flexing. In the leaf spring the friction between the leaves provide the damping effect but sometimes it is not sufficient so we used shock absorbers. In case of helical springs the whole damping effect is provided by the shock absorber. The shock absorber controls the excessive spring vibration and prevents the spring to vibrate even after bump. The shock absorber absorbs the energy of the shock and converted into vertical movement of axle by providing damping and dissipating the same into heat. 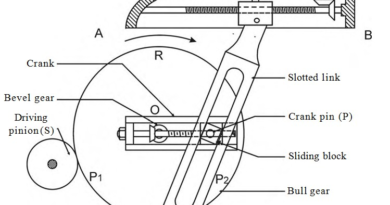 In these types of shock absorber whole damping effect is provided by the friction force between two moving parts. These types of shock absorber almost become obsolete due to it not-predictable damping characteristics. In this type of shock absorber hydraulic fuel is used to resist the motion of the spring. It is work on basic principle of Pascal law that when a piston force the fluid in a cylinder to pass through some hole, a high resistance to the movement of piston is developed, which provides the damping effect. The main advantage of this type of shock absorber is that the damping is proportional to the square of the speed. So for small vibrations the damping is also small, while for larger ones the damping becomes automatically more. It is the ratio of the shock absorber resistance to upward movement and to downward movement. It describe the percentage of the shock absorber’s total resistance is in compression and what percentage in extension. Most shock absorbers are designed for 50/50 ratio only. This ratio does not notify the capacity of shock absorber. The actual damping rates are controlled by the piston and orifices size.